The manager will spend the first two games of the 2012/13 season in the stands. 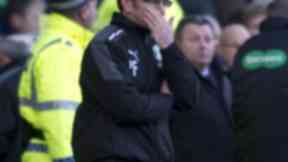 Hibernian boss Pat Fenlon has been handed a four match suspension by the Scottish Football Association. The manager will spend the first two games of the 2012/13 season in the stands, with the other two matches suspended until the end of the campaign in the event of further misconduct. 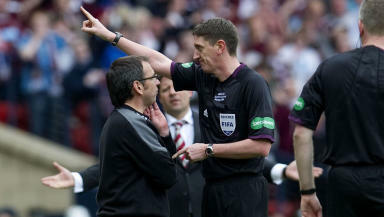 Fenlon was found guilty of breaching Scottish FA disciplinary rule 203, having been accused of making an offensive gesture towards Hearts fans in his side's 5-1 defeat to their Edinburgh rivals in the Scottish Cup final on May 19. The Hearts support had mocked the Hibs boss by singing "there's only one Pat Fenlon" as full time approached in the match. 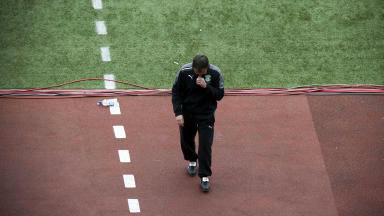 Fenlon had initially denied the gesture had been made towards the opposing fans, saying it was instead made in frustration at his team's performance. “I made a gesture in relation to the way we were playing," he said. We kept giving the ball away cheaply.